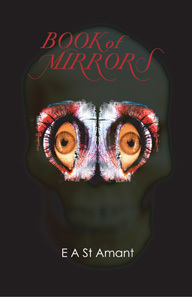 The battle of Mirror Island is provoked over UnHoli’s Book of Mirrors and is a wild adventure into the occult. E A St Amant has applied modern Biblical myth and reinterpreted divine archaeology, bringing it to a dark startling outcome. An immaterial expanding universe of spirit and matter, creating paths for angels and avatars who can, like man, choose between good or evil. It’s a glimpse into a counter reality.